The vinyl covered foam backrest and seating surface of the Medline Padded Transfer Bench offer a highly resilient cushioned surface for comfort. 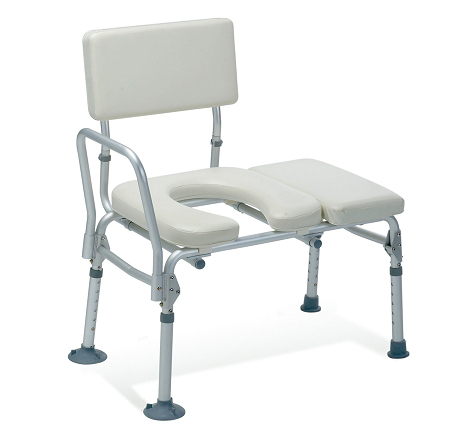 A commode opening allows the user access for personal hygienic care. The lightweight, aluminum frame folds for convenient storage. Height adjusts from 13" - 20" in 1/2" increments. Side arm, seat handle, and suction cup foot pieces provide extra stability and leverage when transferring. Backrest adjusts for right or left facing tubs. 300 lbs weight capacity. Seat to Floor Height: 13" - 20"